Where Do Frogs Go in the Winter? See "3 Strikes, You're Out"
Quite soon, buried in shallow soil beneath leaf litter, some frogs will turn into frogsicles. As the temperature plummets, Wood Frogs and Spring Peepers, among others, fill their cells with glycerol, a natural antifreeze derived from sugar. This allows more than half the water in a frog to freeze, without disrupting cells, tissues or organs. Breathing and heartbeat stop as they become little blocks of ice, which can thaw and become active again in as little as an hour. At this time of year bat species such as the Little Brown Bat are also moving into safe areas like caves and mines for their long winter hibernation. Many people feel that bats are creepy and scary but in reality these amazing creatures are nature’s superheroes of insect control. Their immense appetite for flying pests such as moths and mosquitoes helps support a healthy environment by reducing the need for insecticides. Unfortunately, North American bat species are under attack by a nasty and fast-moving invasive microbe. White nose syndrome is caused by a fungus that originated in Europe known as Pseudogymnoascus destructans (formerly Geomyces destructans). This fungus grows and thrives in the humid cool conditions of the caves where bats gather. Researchers believe the fungus interrupts the hibernation process by irritating the skin. This causes the bats to awaken and use their fat reserves, leading to starvation and death. 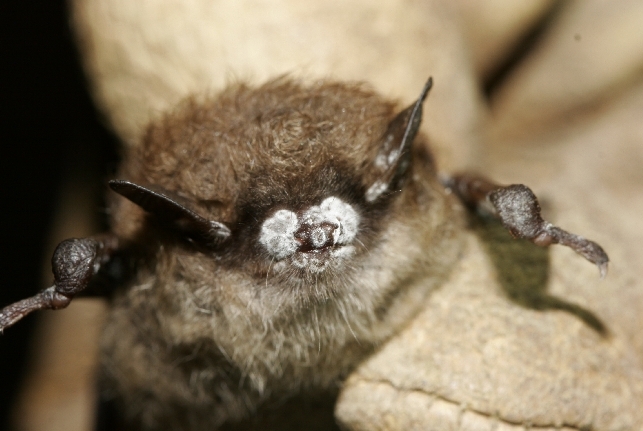 White nose syndrome was first found in eastern Canada in 2010 and has quickly ravaged bat populations in NB, NS, Quebec and ON to the point where three of our most common bat species (Little Brown Bat, Northern Myotis and Tri-colored Bat) are now endangered. On a cautiously optimistic note, bat numbers are increasing in some of the caves where White-nose was first discovered, perhaps an early sign that bats can adapt to the disease. However, it has now been found in Washington state, 2100 km further west than previously found, as well as in Newfoundland and Manitoba, supporting the notion that people can spread the syndrome. It is up to all of us to help protect these remarkable flying mammals. Report unusual bat sightings like daytime flying in winter. You could also take action by building and installing a bat house that creates summer habitat for these night creatures who provide us with free pest control services! Now that most of the leaves are down, basketball-sized leaf balls are very evident in some trees. These are actually squirrel nests (Red or Eastern Gray), and are called dreys. They are lined with shredded vines and grasses, and may have a floor of twigs. Here’s a view in cross-section. 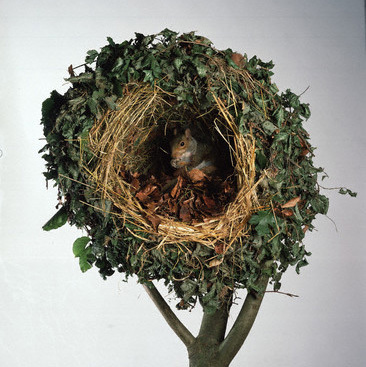 Squirrels will also utilize cavities in trees, adapt old crow’s nests or even use large bird boxes. Red Squirrels will also burrow underground, often in a scale midden (note the burrow entrance) that they produce by shredding cones to get at the seeds. By doing this in the same place, year after year, a midden builds up. If you go quietly enough through the woods, you can often hear Red Squirrels tearing these cones apart with their teeth. Squirrels are active all winter, hunkering down only in the worst weather. 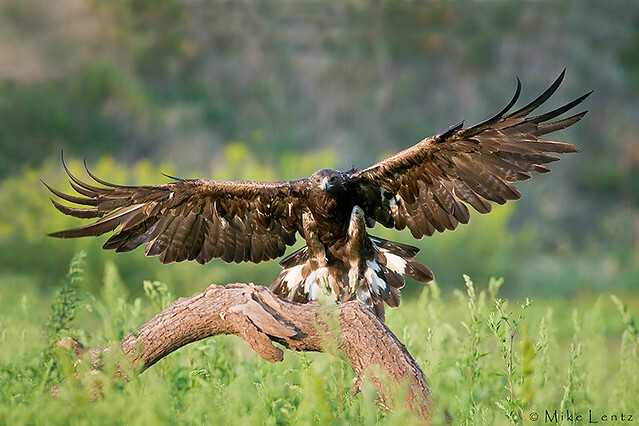 Migrating Bald and (more occasionally) Golden Eagles are arriving in the Kawarthas, and may visit your area as well. As northern lakes and rivers freeze, these birds are forced south to look for food. Areas of high deer populations attract eagles, as they will scavenge on carcasses. They will also feed on fish and ducks, or ducks either frozen in new ice, or unable to take off across it. A good place to look for eagles is you local dump early in the morning. American Crows are migrating. Look for flocks high in the sky, moving towards the southwest. The crows will gather to form massive roosts at this time of year. From late November until March, hundreds of thousands of crows may gather in your area each evening until spring arrives and they go back to their home territories to start the nest-building and breeding process. For some hypotheses on why crows do this, go here and scroll down a bit. American Crows are fairly easy to identify and their intelligence is legendary, going back literally thousands of years. Try this activity for Primary and early Junior students, based on Aesop’s Fable, “The Crow and the Pitcher”, and see if the fable holds true. 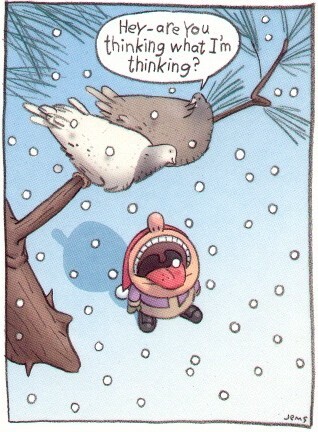 Enjoy the first snows. Snowflakes come in many shapes and sizes, depending on the atmospheric conditions where they formed, and as they made their way to the ground. Go outside during a light snowfall, and catch flakes on jacket sleeves or mitts (but perhaps not tongues), and look at them through a magnifying lens. Here’s a great site about snowflakes – you can even watch snowflakes grow. Activities for kids can be found here. November’s full moon occurs on the 22nd, and is referred to as the Beaver Moon. Venus is at it’s brightest in the predawn sky in late November and early December, a combination of closeness and the amount of the planet that is illuminated by the sun. It is 2.5 times brighter than at its dimmest.